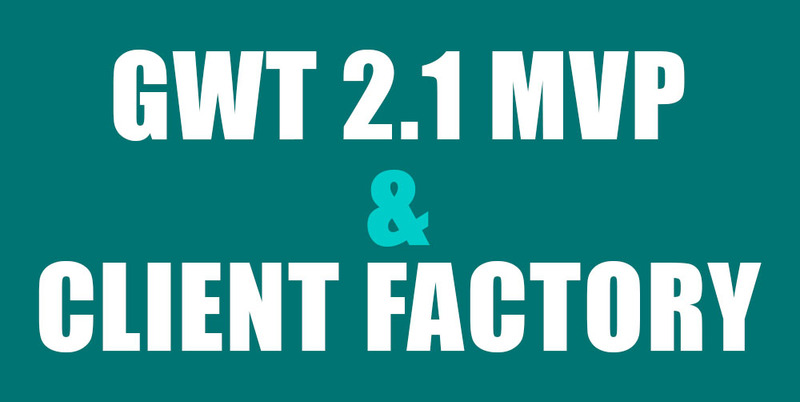 GWT 2.1 is still under development but GWT 2.1 RC 1 was released a few days ago and we’re well excited. They’ve got some wonderful new classes and interfaces like Activities, Places and EventBuses which help manage complex applications. The only thing is about the above articles is that the first one identifies how to use Activities & Places using the new GWT 2.1 architecture. However, the second and third articles, although brilliant, are using a slightly different architecture and are focusing on event buses, rather than GWT 2.1. The second and third ones do however provide a lovely Contact Details example code which works straight out the box and shows how the events work. As a little bit of help to the community, I applied the GWT MVP in 2.1 (Places, Activities and a Client Factory) with the Contact Details example which was brilliantly provided by Chris Ramsdale from the Google Developer team. My updated code can be downloaded here. In case you’re interested in the original Contact Details example from google, that file can be found here. So that’s it. I hope you have found that useful. If you have – please let me know by adding a comment and I’ll gladly answer any questions you may have. 4G in Egypt at last – What does this mean for the average Egyptian? Uber vs Careem, who has the upper hand in the market? Flat 701/702, 38 Falluga Street, Agouza, Giza.